Chevrolet says the Miray's design takes cues from the aerodynamic fuselage of a jet fighter. FRANKFURT -- Chevrolet will give European premieres to the Miray roadster and the Colorado Rally pickup truck concepts at next month's Frankfurt auto show. 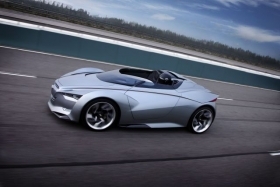 The Miray is a futuristic-looking electric hybrid roadster that could eventually help the automaker fill a gaps in its line-up for a small two-seater sportscar. The Miray's styling takes its cues from the aerodynamic fuselage of a jet fighter, according to Chevrolet. It has an aluminum chassis and carbon fiber and plastic panels to help reduce weight. The concept retains recognizable elements of the Chevrolet brand, seen in the grille, tail lights and fenders, which resemble those of a Corvette. Inside, the futuristic theme continues with ambient lighting, rear vision cameras in place of mirrors and seats that integrate into the car's carbon fiber shell. A lithium-ion battery is used to power two electric motors that drive the front wheels, while the rear wheels are powered by a 1.5-liter turbocharged gasoline engine. The car can be driven on battery power alone. The concept was first unveiled at the Seoul auto show this year. 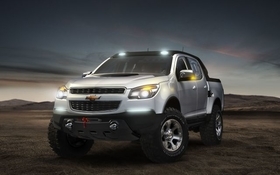 The Colorado Rally concept builds on Chevrolet's truck heritage and offers a preview of the next generation of the Colorado midsize pickup, according to the company. The concept has acrylic windows, heavy duty shock absorbers and a winch and is powered by a 2.8-liter turbodiesel engine. It has all-wheel-drive. Other features include an Air Boost system that can pump clean air into the cabin and a hydration system that ensures the driver and co-pilot receive fluids while driving. The Colorado Rally concept includes an Air Boost system that can pump clean air into the cabin. The concept was first revealed at the 2011 Buenos Aires auto show. A production version is due to go on sale in Thailand later this year.